The Information and Communication Technology (ICT) University, Louisiana, United states has concluded plans to donate ICT equipment worth $250,000 (N90 million equivalent) to Kaduna State University (KASU). The intervention was to promote academic excellence among both the lecturers and the students of KASU through e-learning and e-library as the case in other climes. Addressing newsmen shortly after the signing of the Memorandum of Understanding (MoU) with KASU, President, Board of Trustees, ICT University, Professor Victor W A Mbarika said, the choice of the university was based on its seriousness on research, science and technology. According to him, “we are here to sign a memorandum of agreement between ICT University, USA, and Kaduna State University to provide e-learning and e-library services to this great institution that already has a great reputation in higher education space in Nigeria and Africa. “KASU has a good reputation in terms of research science and technology. We are not starting anything new that they have not already laid the foundation for. So, it is an outstanding institution and we have always have interest in equipping higher institution that is very serious. “The average cost of e-learning and e-library centre is about $250,000 and so we are exited that many of our funding organisations in the United States and other countries around the world are chipping in to make this happen. “We don’t waste time. We should have the commissioning within the next two months maximum. The shipment will take place probably in the next two to three weeks as soon as I head back to the US I will give the order. “The beauty of the intervention is that, the students will have full access to their courses online and we are not just talking about their assignments, we are talking about real time teaching online. “We are setting up what we are giving in such that while the lecturers are teaching, the students can see it themselves. So it will benefit the students a lot. “Their assignments can be downloaded from the system, they can have discussion group on the system and interact with one another. It is a great interactive system that we are providing here. They will be able to download books on their phones, iPads, laptops and all that thereby making learning available to them always wherever they are. “We have built our system so they can run in low bandwidth areas where their internet is not stable or as fast as other countries where Nigeria fits well. “Besides, Most African students cannot afford textbooks if they are to buy five in a semester. So, they will be getting free download in PDF format and can use anywhere”, he added. 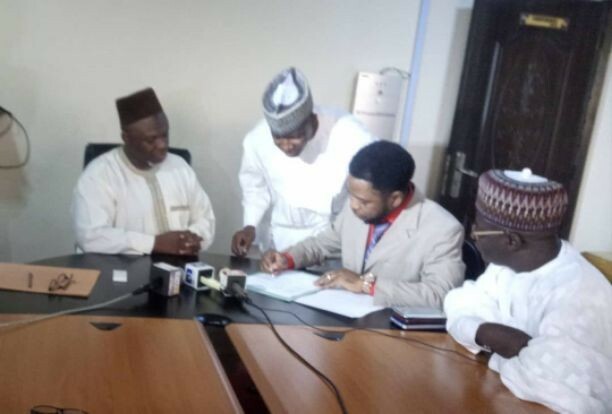 The Vice Chancellor, KASU, Professor Muhammed Tanko, optimistic that the five years MoU with American varsity would add value to his university especially now that the state government is doing everything possible to revamp the education sector if its economy. “Its actually MoU to help the university in term of infrastructure development in ICT. We have the population. So we have the need for their service and at the end, we will be providing a segment of the deal while they provide other services. Kaduna government is helping to finance the MoU. “The signing is about empowering the university in terms of infrastructure so once we start and feel we are okay, we will complete the exercise”, the vc stressed.